An often overlooked aspect ofvaping, is how you vape. Specifically the way your mouth interacts with the vapour when inhaling. Many don’t give this a second thought, but a little knowledge could greatly improve your experience. In this article, we’ll take a detailed look at each method, and help you decide which is best for you. The two main ways of taking a hit when vaping are Mouth To Lung (MTL), and Direct Lung Inhale (DLI). Each technique produces very different results, with MTL regarded as most similar to smoking a cigarette, while DLI can be compared to the hit from a shisha pipe or bong. Various factors come into play, such as ohm resistance, battery strength and airflow, but it also depends on the way the user interacts with their kit. Different methods give different results, helping with anything from cloudchasing, chain-vaping or increased flavour. How – Mouth to lung vaping is much as it sounds – you take the vapour into your mouth first, before inhaling to the lungs. It’s similar to sucking on a straw: you take a long draw and let your mouth fill with vapour. Then you inhale, sucking in extra air into your lungs. Smokers and ex-smokers will recognise this as similar to the way cigarettes are usually smoked. 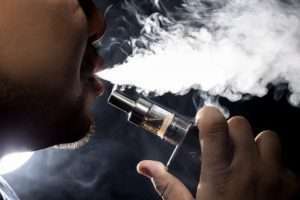 Long-time vapers will be accustomed to this technique, as the technical limitations of early commercial e-cigarettes suited this type of inhale. Results – The sensation is more subtle compared to direct lung hits but as vapour remains in the mouth for longer the flavour is more apparent. Cigars and cigarettes are usually smoked this way, so it can be especially useful for those trying to quit. Chain-vaping is easier as the leisurely intake of vapour means a reduced throat hit, particularly when using e-juice containing nicotine. Equipment – This technique works best with tanks that use high ohm coils (1.2 ohm and above) such as the Kayfun and Mini Nautilus, low battery strength (15w and below) and with a narrow drip-tip. E-juice will usually contain a substantial proportion of PG (anything up to 100%), with whatever nicotine strength you prefer. It is possible to use the MTL draw technique when using a sub-ohm set-up but the vape tends to get uncomfortably hot. Uses less juice– Due to the slow inhalation, the e-liquid is vaporised at a slower rate meaning your favourite juice will last longer. Cooler vape– As it usually involves lower battery power, this reduces the risk of the vape becoming too hot. Useful for quitting smoking – The technique is similar to way cigarette and cigar smoke is inhaled, which is useful for those trying to quit. The overall sensation is more gentle than DLI, making it more suitable for beginners and casual vapers. Better flavour– The prolonged exposure to the tastebuds, along with an increased use of PG – a better flavour-carrier than VG – means the taste can be more noticeable when using this method. Weaker – In comparison to a direct lung inhale, a mouth to lung hit is less intense, and arguably less satisfying. Outdated – The increased focus on sub ohm vaping in recent years has led to MTL inhalation being associated with inferior technology. Indeed, most modern tanks on the market focus on sub-ohm vaping at the expense of tanks more suited to MTL. How – A direct lung inhale involves drawing the vapour straight down into the lungs, much like breathing in deeply or sucking the air from a balloon. This way dense vapour quickly fills the lungs, similar to the sensation of using a shisha pipe. This draw method is most commonly associated with sub-ohm vaping. Results – DLI gives a more intense hit than MTL, which many vapers find more satisfying but can sometimes feel overwhelming. Best results require heating the e-liquid at high temperatures so you need to draw quickly to avoid a hot vape. As a result, the throat hit is more intense so levels of PG and nicotine need to be reduced appropriately. If cloudchasing is your thing, DLI is the key to producing thick billowing clouds of vapour. Equipment – An optimum direct lung hit requires an RDA or sub-ohm tank, such as the Kanger Subtank or Smok TFV4. Subsequently, this means a juice that’s high in VG and low in PG. Nicotine levels of 6mg and below are advised, to counter the increased intake of vapour and resulting throat hit. It is possible to lung inhale with plus-ohm coils but it’s less common as the vapour production is less and the sensation more muted. Satisfying – A direct lung hit is more powerful than mouth to lung. This can feel more fulfilling, particularly for smokers and ex-smokers who want a more striking throat hit. Clouds – DLI is the best method for producing thick plumes of vapour. Stealth-vaping– When using a high ohm coil, taking a deep lung hit and holding it in for a few seconds makes the vapour dissipate before you exhale. Useful if you want your vaping to be low-key. Risk – This form of inhale brings added risks. You need to draw quickly to keep the vape cool, and tweak your level of PG and nicotine to avoid harsh throat hits. Make sure your e-juice doesn’t run dry as a lung hit of burnt cotton is the stuff of vaping nightmares. DLI requires some basic knowledge of vaping, so isn’t recommended for beginners. Overwhelming – A direct lung hit can sometimes feel overpowering as you’re taking in more vapour in one hit, along with nicotine. It’s less relaxed and casual than MTL. Limitations – This method reduces your flexibility when it comes to PG and nicotine. Reduced levels of each are required to avoid a harsh throat hit. Can you also mention the types of Mods & appropriate accessories – suitable for both the methods !? It’ll help buyers make relevant and accurate choice, especially when one doesn’t ah e your contact numbers to call and place an order with explanation !